Think most netbooks have single-core processors, 1GB of RAM, and a 160GB hard drive because their manufacturers like conformity? Right. The reality -- never officially acknowledged -- is that Microsoft doesn't cheaply license its operating systems to netbooks with specs that are too good (see the limitations at TechARP). The result, as evidenced by the looming retirement of Dell's Mini 12, is tiny netbooks with lesser hardware than full-sized laptops. The crime: Dell's Mini 12 is one of a few netbooks with a 12-inch screen. While that's fine for licensing of Windows XP or Vista (the Mini 12 used the latter), cheap Windows 7 licensing will require netbooks to cap the screen size at 10.2 inches. Punishment: With no clear explanation why, Dell announced the Mini 12's retirement over the weekend. I'm guessing the company saw the writing on the wall, and decided to discontinue the model rather than face more expensive operating system costs when Windows 7 arrives. icitly ban hybrid drives -- it only says a netbook needs a certain size of one or the other -- that's the rumor. Punishment: MSI's act of disobedience was dead in the water just as it began. A company representative in the U.K. told Netbook Choice that MSI would sell its current stock of U115 netbooks, and then cease production at Microsoft's request. cheap OS licensing, packing a 500GB drive instead of the maximum 160GB, along with 2GB of RAM. As such, this particular build of the Archos 10 runs on Ubuntu instead of Windows XP. Punishment: The Archos 10 is living in relative obscurity, released with little fanfare in France only. It's not clear when, if ever, the netbook will migrate into the United States or the rest of Europe. particularly egregious offender. It's the first netbook with a dual-core processor, spiting Microsoft's decree that netbooks should have single-core chips. Punishment: The Everun Note was already on the pricey side, starting at $599 for a basic configuration, but that's without an operating system. Add an undiscounted copy of Windows XP and you've got a netbook that's even harder to market. g tiny computers: 2GB of RAM. But as with the Archos 10, this feature was available only for the version running Ubuntu, as Microsoft would not allow such vast amounts of memory when licensing Windows XP on the cheap. 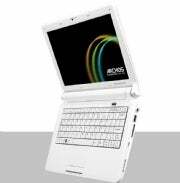 Punishment: The Mini 9 is another netbook heading the way of the dodo. Though its screen size is mainly to blame, I'll bet the computer would still be in demand if it packed Windows XP and 2GB of RAM. In any case, the only remaining Mini 9s in stock run on Windows XP.